Hearing loss is defined as a sudden or gradual decrease in how well one can hear. Hearing loss comes in many forms. It can range from a mild loss in which a person misses certain high-pitched sounds, such as the voices of women and children, to a total loss of hearing. It can be hereditary or it can result from disease, trauma, certain medications, or long-term exposure to loud noises. Hearing loss is one of the most common conditions affecting older adults. Approximately 17 percent, or 36 million, of American adults report some degree of hearing loss (NIDCD). The Internet is information. That information can be presented visually or audibly. It can be presented in graphics, video, audio, animation, or in text. Our most common experience with web content is what we view through the portal of our web browser, which generally consists of text and graphics, but the Internet is increasingly consisting of video and multimedia content. Take a look at the homepage of most popular news sites and you’ll find numerous video clips. Audio content, such as videos with voices and sounds, without captions or transcripts. Media players that do not display captions and that do not provide volume controls. Media players that do not provide options to adjust the text size and colors for captions. Web-based services, including web applications that rely on interaction using voice only. One of the most effective ways of making websites accessible to people who have a hearing disability is to include captions with any video footage that is included on a site. Captions are the textual representation of a video’s audio track, and are an excellent way of making sure those who are deaf or hearing impaired can access the information in a video. Captioning your videos on your web page also means that search engines will more accurately index them, leading to more people finding your content. Use a video that provides captioning, such as YouTube or Vimeo. Review the automatic captioning for misspelled words, grammar and punctuation errors. 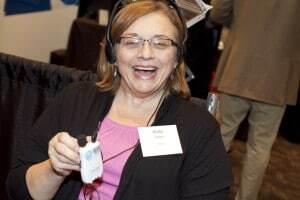 With the burgeoning emphasis on accessibility, along with monumental strides in technology, Kate is optimistic about the future for those with a hearing impairment. Read more about Kate Striving to Hear in a Digital World .